In 2016 Outside the Ball landed in top cities, experienced some of the best tournaments, and partied with the pros to bring fans exclusive content! The year would not be complete without a fond look back at the exciting memories we shared with your favorite tennis stars. Watch host Mayleen Ramey dive into this year’s archives and select her top 5 favorite moments! 5. Grigor Dimitrov turned into a master of disguise, for a good cause! The tennis star was nearly unrecognizable as he joined Ramey for a walk around the Delray Beach event. “Johnny”, as he called himself spent the afternoon showing appreciation for the people who work behind the scenes. Posing for photos, asking for autographs, and charming women with flowers, Dimitrov served the star treatment to those who deserved it the most! 4. Fabio Fognini spiced up his life! Let’s face it, none of us can escape the allure of a good internet quiz. From what actor we should marry to what kind of cheese we are, this is all vital information about our personality! In this fun moment, Fognini swiped through a section of questions to discover which Spice Girl he is. Hint: It’s not Sporty. 3. Genie Bouchard heated things up with food themed pickup lines! At the Taste of Tennis party in Miami, the McGorgeous Candian seduced fans with sweet and savory flirtations. With a lot of laughter and sultry looks to the camera, Bouchard proved to be quite the FineApple! 2. Alexander Zverev got the Meme treatment! With the rise of internet culture, Memes have become as popular as cat videos and animated gifs. From the relatable to the ridiculous, we presented the rising star with photos and funny captions that we created just for him. Zverev read through the personalized Memes until he chose one that received the Sascha Seal of Approval! 1. Serena Williams sang her way to victory! It’s tough to complete with Serena as the American sang and danced her way to Ramey’s top spot. Williams is known as a karaoke Queen, so we put her skills to the ultimate test in a Girl Power Pop Quiz. Ramey started off by reciting the beginning of a lyric in a popular female anthem and Williams was tasked to finish it. Before Mayleen could complete a sentence, Serena was roaring with delight over recognizing the hit Katy Perry song and continued to showcase the dominance we expect from the champion! While Mayleen compiled a list of her favorite moments, the fans have spoken as to which video they want bringing them into the new year! Our Fan Favorite video showcased Novak Djokovic in a way you have never seen him before, trading places with a ball girl! As you can see, 2016 has been an exciting year for us. We surpassed over 7 million views on our website and launched a TV show to over 60 million households! All of us at Outside the Ball want to thank you for watching and we encourage you to keep up with all the action on our Twitter, Instagram & Facebook. Don’t miss a single video in the new year and subscribe to our Youtube channel! See you in 2017! 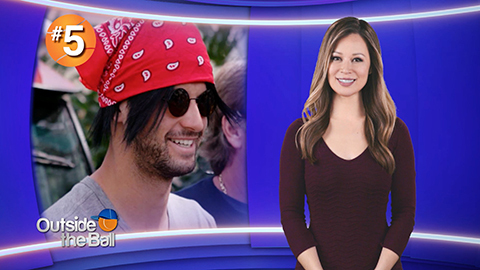 Outside the Ball Web Show 2 – Hosted by Mayleen Ramey, Featuring Dimitrov & Djokovic Outside the Ball Web Show 3 – Serena Williams, Sam Querrey, Sloane Stephens & Madison Keys Is Grigor Dimitrov Joining a Boy Band? Watch Dimitrov Get His Groove On to the Backstreet Boys. Novak Djokovic, Wimbledon Champion, and Grigor Dimitrov Do a Strip Tease Dance on the Court How Well Do Fans Know Grigor Dimitrov? Find Out in the Grigor Dimitrov Fan Challenge! Did Dimitrov’s Wimbledon opponent Djokovic plant these difficult questions for him? Previous ArticlePetra Kvitova Gives Her Favorite Meme PETRA APPROVAL!